^ 3.0 3.1 Численность населения Республики Казахстан по отдельным этносам на начало 2016 года. [2017-05-24]. （原始内容存档于2017-10-14）. ^ 4.0 4.1 4.2 4.3 Kazakhstan. World Economic Outlook Database. 國際貨幣基金組織. October 2016 [2017-01-26]. （原始内容存档于2017-02-02）. ^ Gini index. 世界银行. [2015-11-21]. （原始内容存档于2015-02-09）. ^ 7.0 7.1 7.2 7.3 Kazakhstan 互联网档案馆的存檔，存档日期2017-10-30.. CIA World Factbook. ^ 大英百科全书, Kazakhstan: Introduction 互联网档案馆的存檔，存档日期2015-06-17.. Retrieved: 7 June 2016. ^ Agency of Statistics of the Republic of Kazakhstan (ASRK). 2005. Main Demographic Indicators. Stat.kz. [2010-06-01]. （原始内容存档于2010-03-14）. ^ 10.0 10.1 Zarakhovich, Yuri. Kazakhstan Comes on Strong. Time. 2006-09-27 [2015-12-13]. （原始内容存档于2015-12-07）. ^ Census2010. Stat.kz. [2010-06-01]. （原始内容存档于2013-10-12）. ^ 12.0 12.1 The results of the national population census in 2009. Agency of Statistics of the Republic of Kazakhstan. 2010-11-12 [2010-01-21]. （原始内容存档于2011-07-22）. ^ Marcus Goncalves; Erika Cornelius Smith. Eastern European Economies: A Region in Transition. Business Expert Press. 2016-06-27: 210–. ISBN 978-1-63157-400-9. （原始内容存档于2017-12-16）. ^ The constitution of Kazakhstan 互联网档案馆的存檔，存档日期2009-04-18., CONSTITUTION OF THE REPUBLIC OF KAZAKHSTAN: 1. The state language of the Republic of Kazakhstan shall be the Kazakh language. 2. In state institutions and local self-administrative bodies the Russian language shall be officially used on equal grounds along with the Kazakh language. ^ Surucu, Cengiz. Modernity, Nationalism, Resistance: Identity Politics in Post-Soviet Kazakhstan. 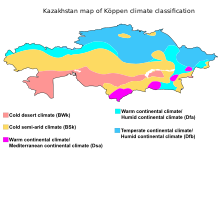 Central Asian Survey（英语：Central Asian Survey）. 2002, 21 (4): 385–402. doi:10.1080/0263493032000053208. ^ WorldViews. The Washington Post. （原始内容存档于2014-02-14）. ^ Ikawa-Smith, Fumiko. Early Paleolithic in South and East Asia. Walter de Gruyter. 1978-01-01: 91. ISBN 9783110810035. （原始内容存档于2017-12-16） （英语）. ^ Kazakhstan. Microsoft Encarta Online Encyclopedia. 2005. （原始内容存档于2005-04-15）. ^ Official site of the President of the Republic of Kazakhstan – Kazakhstan. Akorda.kz. [2013-03-26]. （原始内容存档于2013-03-23）. ^ North Atlantic Treaty Organization. Signatures of Partnership for Peace Framework Document. 2006-10-05. （原始内容存档于2006-11-29）. ^ Joint Statement on the meeting between President Obama and Kazakhstan President Nazarbayev | The White House 互联网档案馆的存檔，存档日期2015-11-20.. Whitehouse.gov (11 April 2010). Retrieved 14 January 2013. ^ "Readout of the President's Call to President Nazarbayev of Kazakhstan" | The White House 互联网档案馆的存檔，存档日期2015-11-20.. Whitehouse.gov (30 April 2011). Retrieved 14 January 2013. ^ Kazakhstan became member of UN Human Rights Council. Tengrinews.kz English. 2012-11-13. （原始内容存档于2016-01-01）. ^ Blank, Stephen. Kazakhstan's Foreign Policy in a Time of Turmoil. EurasiaNet. 2005-04-27 [2017-07-16]. （原始内容存档于2016-03-04）. ^ Cohen, Ariel. Kazakh foreign minister insists balanced foreign policy remains intact. Business News Europe. 2008-10-07. （原始内容存档于2009-08-17）. ^ Kazakhstan, UN Continue Building on Two-Decades of Cooperation. Astanatimes.com. [2016-02-14]. （原始内容存档于2016-02-19）. ^ Sweden, Bolivia, Ethiopia and Kazakhstan elected to Security Council. un.org. [2016-11-23]. （原始内容存档于2016-11-25）. ^ 33.0 33.1 Kazakh peacekeepers in Western Sahara. Tengrinews. （原始内容存档于2014-11-08）. ^ Kazakhstan delivers humanitarian aid to Ukraine. Global Post. （原始内容存档于2015-02-05）. ^ Nazarbayev Offers to Mediate in Ukraine, Stresses Kazakhstan’s Economic Resilience. The Astana Times. （原始内容存档于2015-12-08）. ^ 36.0 36.1 Nazarbayev as Mediator. Carnegie Endowment for International Peace Moscow Center. （原始内容存档于2015-12-08）. ^ Kazakhstan Urges Peaceful Resolution to Ukraine Conflict, Reiterates Minsk Agreements. The Astana Times. （原始内容存档于2015-12-08）. ^ 存档副本 (PDF). [2017-11-27]. （原始内容存档 (PDF)于2017-11-27）. 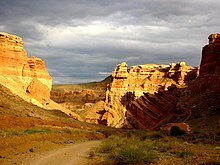 ^ Kazakhstan – MSN Encarta. （原始内容存档于2009-11-01）. ^ The Coldest Capital Cities In The World. WorldAtlas.com. [2017-01-15]. （原始内容存档于2017-01-08）. 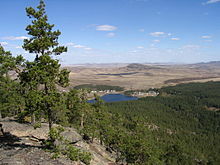 ^ Kazakhstan climate information. Weatherbase. [2016-02-04]. （原始内容存档于2016-01-02）. ^ Celestial Silk Road 5th–21st June 2016. viranatura.com. [2015-05-26]. （原始内容存档于2016-03-05）. ^ Red Book. 联合国环境署 (UNEP). [2016-12-08]. （原始内容存档于2016-12-29）. ^ IMF Executive Board Article IV consultation1 with Kazakhstan. Imf.org. International Monetary Fund. [2016-02-14]. （原始内容存档于2016-03-03）. ^ Kazakhstan profile. State.gov. US State Department. [2016-02-14]. （原始内容存档于2016-01-01）. ^ GDP growth (annual %). The World Bank. World Bank.org. [2010-06-01]. （原始内容存档于2011-05-31）. ^ № 1 in the world. The Atomic Company Kazatomprom, Kazatomprom.kz. 2009-12-30 [2010-06-01]. （原始内容存档于2011-07-22）. ^ Uranium and Nuclear Power in Kazakhstan. world-nuclear.org. 2011-02-17 [2011-03-05]. （原始内容存档于2013-03-26）. ^ Kazakhstan: The Latest Emerging Opportunity. BRIC Plus. （原始内容存档于2015-06-20）. ^ Kazakhstan Profile. The World Bank. （原始内容存档于2014-09-11）. ^ International Crisis Group. (May 2007). Central Asia's Energy Risks, Asia Report No. 133 互联网档案馆的存檔，存档日期2016-03-03. ^ Arable Land per inhabitant World Bank database.. The World Bank. （原始内容存档于2015-02-10）. ^ Pollan, Michael. Apple sweetness. The Botany of Desire. San Francisco: KQED. 2009 [2010-11-29]. （原始内容存档于2010-10-10）. ^ The official site of Almaty city: History. Almaty.kz. 2010-01-12 [2010-06-01]. （原始内容存档于2010-10-13）. 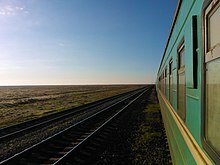 ^ Transportation - Kazakhstan - infrastructure. www.nationsencyclopedia.com. （原始内容存档于2013-06-16）. ^ 62.0 62.1 The World Factbook — Central Intelligence Agency. www.cia.gov. （原始内容存档于2017-10-30）. ^ "Head Office Archive.is的存檔，存档日期2012-07-17." Air Astana. Retrieved on 21 December 2010. "Registered office 4A, Zakarpatskaya Street, Almaty, 050039, Kazakhstan"
^ Air Astana named Best Airline in Central Asia & India. The Gazette of Central Asia (Satrapia). 2012-07-17 [2012-07-20]. ^ Итоги переписи населения Республики Казахстан 2009 года [Results of the population census of the Republic of Kazakhstan 2009]. Stat.kz. 2010-02-04 [2010-06-01]. （原始内容存档于2010-02-12） （俄语）. ^ 67.0 67.1 Перепись населения Республики Казахстан 2009 года. Краткие итоги. (Census for the Republic of Kazakhstan 2009. Short Summary). Republic of Kazakhstan Statistical Agency. [2010-12-10]. （原始内容 (PDF)存档于2010-12-12） （俄语）. ^ Collins, Cheryl. Kazakhstan's `forgotten Poles' long to return. Cdi.org. 2003-01-02 [2010-06-01]. （原始内容存档于2007-02-15）. ^ Clarey, Christopher. Politics, economics and time bury memories of the Kazakh gulag. International Herald Tribune. 2007-01-01 [2013-09-09]. （原始内容存档于2007-01-04）. ^ Greenall, Robert. Russians left behind in Central Asia. BBC News. 2005-11-23 [2013-09-09]. （原始内容存档于2013-09-11）. ^ "Всесоюзная перепись населения 1926 года" 互联网档案馆的存檔，存档日期2015-02-08.. demoscope.ru. ^ "Всесоюзная перепись населения 1970 года" 互联网档案馆的存檔，存档日期2009-12-03.. demoscope.ru. ^ "Всесоюзная перепись населения 1989 года" 互联网档案馆的存檔，存档日期2010-03-16.. demoscope.ru. ^ The constitution of Kazakhstan 互联网档案馆的存檔，存档日期2009-04-18., CONSTITUTION OF THE REPUBLIC OF KAZAKHSTAN 互联网档案馆的存檔，存档日期2007-10-20. : 1. The state language of the Republic of Kazakhstan shall be the Kazakh language. 2. In state institutions and local self-administrative bodies the Russian language shall be officially used on equal grounds along with the Kazakh language. ^ 78.0 78.1 Kazakh language to be converted to Latin alphabet – MCS RK 互联网档案馆的存檔，存档日期2017-02-19.. Inform.kz (30 January 2015). Retrieved 28 September 2015. ^ Kazakhstan in 2013. Ministry of National Economy of the Republic of Kazakhstan Committee on Statistics: 33. 2014. （原始内容存档于2015-09-29）. ^ 向28年执政说再见 纳扎尔巴耶夫辞职演说全文. 新浪网. 2019-03-20. ^ Religious Composition by Country, 2010–2050. pewforum.org. 2015-04-02. （原始内容存档于2017-05-06）. 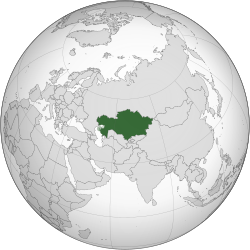 ^ Kazakhstan – Pew-Templeton Global Religious Futures Project. globalreligiousfutures.org. （原始内容存档于2016-11-13）. ^ 83.0 83.1 83.2 83.3 Religious Situation Review in Kazakhstan 互联网档案馆的存檔，存档日期2010-05-11. Congress of World Religions. Retrieved 7 September 2009. ^ Pew Forum on Religious & Public life, Chapter 1: Religious Affiliation. 2012-08-09 [2016-12-27]. （原始内容存档于2016-12-26）. ^ 85.0 85.1 85.2 Kazakhstan – International Religious Freedom Report 2008 互联网档案馆的存檔，存档日期2017-07-15. U.S. Department of State. Retrieved 7 September 2009. ^ KAZAKHSTAN: Ahmadi Muslim mosque closed, Protestants fined 100 times minimum monthly wage. Forum 18. [2014-06-06]. （原始内容存档于2014-06-06）. ^ Islam in Kazakhstan 互联网档案馆的存檔，存档日期2009-09-18.. Retrieved 7 September 2009. ^ KAZAKHSTAN: "Mosques cannot be independent". Forum 18. [2014-06-06]. （原始内容存档于2014-06-06）. ^ Kazakhstan. 美国国际宗教自由委员会. 美国国务院. 2009-10-26 [2010-06-03]. （原始内容存档于2012-01-13）. ^ Нац состав.rar. [2011-07-24]. （原始内容存档于2011-07-23）. ^ Cuisine of Kazakhstan. Oriental Express Central Asia. [2017-01-17]. （原始内容存档于2017-01-18）. ^ Kazakhstan Public Holidays 互联网档案馆的存檔，存档日期2016-02-09.. Worldtravelguide.net. Retrieved 14 January 2013. ^ Electronic government of the Republic of Kazakhstan. Egov.kz. [2013-05-31]. （原始内容存档于2015-10-16）. Alexandrov, Mikhail. Uneasy Alliance: Relations Between Russia and Kazakhstan in the Post-Soviet Era, 1992–1997. Westport, CT: Greenwood Press. 1999. ISBN 0-313-30965-5. Clammer, Paul; Kohn, Michael & Mayhew, Bradley. Lonely Planet Guide: Central Asia. Oakland, CA: Lonely Planet. 2004. ISBN 1-86450-296-7. Cummings, Sally. Kazakhstan: Power and the Elite. London: Tauris. 2002. ISBN 1-86064-854-1. Demko, George. The Russian Colonization of Kazakhstan. New York: Routledge. 1997. ISBN 0-7007-0380-2. Fergus, Michael & Jandosova, Janar. Kazakhstan: Coming of Age. London: Stacey International. 2003. ISBN 1-900988-61-5. George, Alexandra. Journey into Kazakhstan: The True Face of the Nazarbayev Regime. Lanham: University Press of America. 2001. ISBN 0-7618-1964-9. Martin, Virginia. Law and Custom in the Steppe. Richmond: Curzon. 2000. ISBN 0-7007-1405-7. Nazarbayev, Nursultan. Epicenter of Peace. Hollis, NH: Puritan Press. 2001. ISBN 1-884186-13-0. Nazpary, Joma. Post-Soviet Chaos: Violence and Dispossession in Kazakhstan. London: Pluto Press. 2002. ISBN 0-7453-1503-8. Olcott, Martha Brill. Kazakhstan: Unfulfilled Promise. Washington, DC: Brookings Institution Press. 2002. ISBN 0-87003-189-9. Rall, Ted. Silk Road to Ruin: Is Central Asia the New Middle East?. New York: NBM. 2006. ISBN 1-56163-454-9. Robbins, Christopher. In Search of Kazakhstan: The Land That Disappeared. London: Profile Books. 2007. ISBN 978-1-86197-868-4. Rosten, Keith. Once in Kazakhstan: The Snow Leopard Emerges. New York: iUniverse. 2005. ISBN 0-595-32782-6. Thubron, Colin. The Lost Heart of Asia. New York: HarperCollins. 1994. ISBN 0-06-018226-1.